Super Bowl Sunday is more than just a sporting event – it’s an experience. A huge part that experience is the food…and unfortunately, most of those foods are just HORRIBLE for you. That’s why we worked out a recipe that takes all the guilt out of one of the fattiest Super Bowl snacks out there – the 7 Layer Dip. Instead of being full of artery-clogging fats, this version sneaks in a ton of fiber, probiotics, and Omega-3 Fatty acids…so it’s actually good for you. It’s so delicious, you won’t even notice the difference! So go ahead & slip this recipe in with the rest of your Super Bowl Feast… nobody but you will know it’s healthy. 1. Make the Beans– Dice the onion and sauté in the olive oil until the edges start to brown. Put the onions, black beans, cumin, oregano & ¼ C water into a food processor or blender. Pulse a few times, until the mixture resembles refried beans. 2. Cook the Rice- In a small pot with a tightly fitted lid, bring the 1 2/3 C. water to boil. Add the taco seasoning and rice. Simmer with the lid on for approximately 40 minutes. 3. Mash the Guacamole- Using a fork, mash the avocado with the lemon juice and a little salt & pepper. 4. Assemble the dip- You can layer this however you’d like, but we recommend layering in this order: Beans, Rice, Guacamole, Greek Yogurt, Salsa, Olives, Tomatoes. 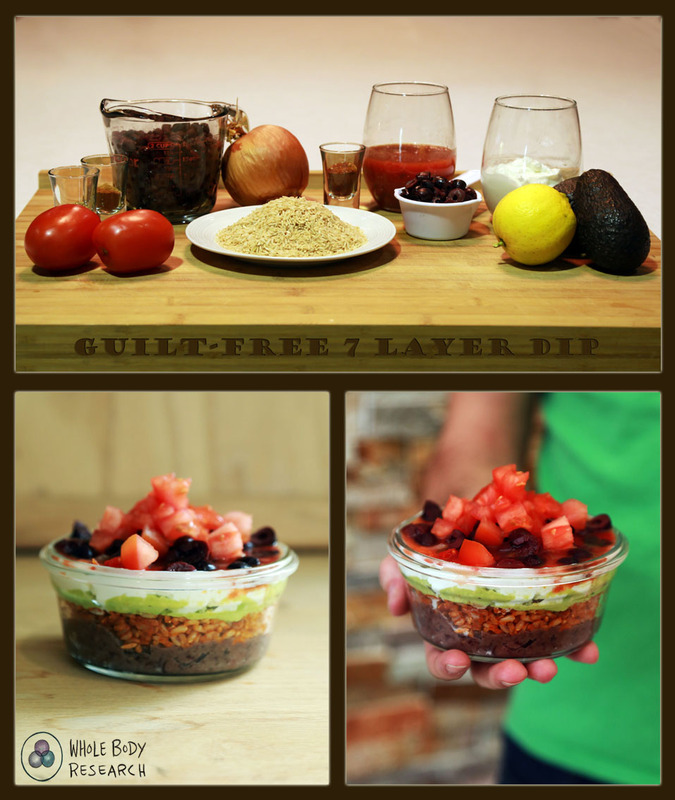 If you want to add a personal touch & encourage portion control by creating individual sized dip bowls. ¼ C. Beans, ¼ C. Rice, 2 Tbsp Guacamole, 2 Tbsp Greek Yogurt, 2 Tbsp Salsa, 1 Tbsp Olives, and approximately 1 Tbsp diced tomato. * Make sure you get a high quality greek yogurt that includes probiotics!